On New Year’s Eve, some people want to party the night away. Others prefer something more low-key like a nice dinner out. And parents of young children have to find something that doesn’t keep their little ones up too late. If you’re having a hard time figuring out what to do this New Year’s Eve, fear not. Montana is home to a variety of events that will please everyone. From firework displays and parades to wine and cheese celebrations, here are the best NYE events in Montana! The Ranch at Rock Creek was named as one of “Forbes Travel Guide’s most luxurious hotels in the world.” See why for yourself this New Year’s by creating a custom itinerary of Ranch activities, including ice skating, horseback riding, New Year’s Raptor Hike, and more. Take advantage of New Year’s Eve falling on a Monday and make a long weekend at Big Sky Resort out of it. Enjoy world-class skiing, a parade, special New Year’s dinner dance, live entertainment, and fantastic fireworks display at midnight. Casey’s, the only nightclub in Whitefish, Montana, is throwing a Vintage Vegas-themed New Year’s bash. The party is only open to those 21 years and older. Contact them directly to inquire about VIP space reservations. Hamiltonians consider stopping by Bitter Root Brewing on New Year’s Eve for the soulful tunes of Steve Winkler. Check out their delicious food, house-made brews, and spend the waning hours of 2018 at the Piano Bar with friends. Celebrate the New Year a little early with your kids at the Great Falls Public Library Dance Party and Balloon Drop. The event takes place on December 29 from 11:30 a.m. until 1 p.m. Head to the Cordingley Room in the basement with the entire family to enjoy the festivities. Uncorked Wine and Cheese Bar, part of The Gourmet Cellar in Livingston, Montana is hosting a special event on New Year’s Eve. Stop in for live music courtesy of Montana Manouche, whose music is described as “joyful and elegant, reminiscent of music played in Paris nightclubs in the 1940s” by their website. The Lewis and Clark Brewing Company is hosting a New Year’s Eve Party with local fan-favorite rock band, Ten Years Gone. The party starts at 7 p.m. and lasts until midnight. Enjoy local music and local brews among great friends. Fergies Pub and Grill’s Adult Prom New Year’s Eve Party promises to “be a great party, not to be missed,” according to their event page. Dress up like you’re going to prom all over again and relive the past as you celebrate the future. 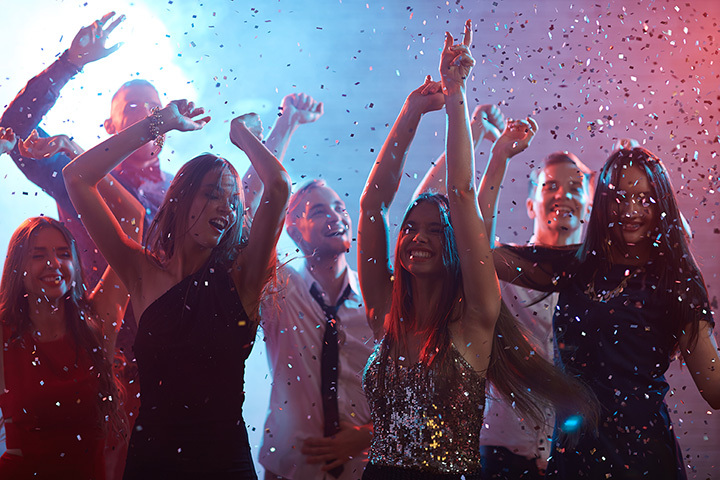 Enjoy live music courtesy of The Flathead V8s and dance the night away like you’re in high school all over again (but this time, with liquor). For those looking for a night out but not a night out late, the New Year’s Dinner at the Gallatin River Lodge in Bozeman, Montana might be the perfect event. Enjoy a delicious dinner of smoked rabbit consume, shaved beet ravioli, pan roasted ostrich, cast iron bison tenderloin, dark chocolate and vanilla bean soufflé, and much more. The Bigfork Inn has seen over 80 New Year’s Eves since opening in 1937, but this year’s bash aims to take the cake. Come on in for live music, dancing, and champagne popping. The party lasts until the ball drops at midnight.